Today is Give.Away.Day! and there are TWO chances to win! 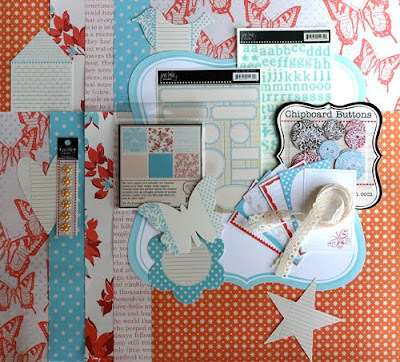 The giveaway here includes the 2nd Quarter Dime Store Kit plus the Open Hodge Podge Mini-album. This would be a fun win! 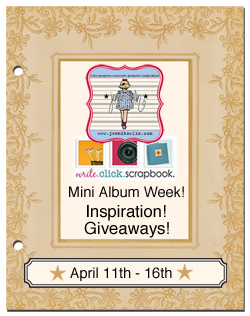 We already have three projects plus instructions posted for it AND there will be a lovely mini-album created with it on the Write.Click.Scrapbook Blog Friday AND next week is Dime Store Week here on the Inspiration Blog! Simply leave a comment telling us what other topics you'd like us to do a special focus week on. We'll randomly choose a winner tonight around 9pm CST. i love Give.Away.Day!!! products are just gorgeous! would love to see a "chipboard" week...fun and new ways to use the great chipboard pieces. I would love to see a week dedicated to fun vintage inspired mixed media projects! Thanks for the chance to win! EEEEK, what an exciting giveaway! I'm LOVING mini album week. I love doing little themed albums! Another topic... how about something along the lines of the mini albums, but maybe with creative folds. Like explosion boxes, paper bag, manilla folders, etc. Thanks for a chance to win!! Woo hoo! Love the giveaway and dedicated mini album week. I would love to see a week of using tart tins. I'd love to see some home decor projects! Just more mini album fun. I love them and need more ideas on making different altered mini's besides just the reg. square chipboard ones. Thanks for the chance! Love mini books, it's all I do anymore. I like small projects that I can finish quickly and Jenni's stuff is perfect for that. I vote for Easter, all those egg hunting pictures and big dinner photos need a new twist. I would say Easter!!! Thanks for the wonderful chance! Thanks for a giveaway!!! I love to do home decor canvas projects!! OH, my goodness - you have no idea how much I want this kit!!!! Thank you SO MUCH for the chance to win it!! I would also say home decor items - you girls area FABULOUS at creating those sweet little pieces to hang on your wall, and I would love to learn more about how you do it. Thank you again!! I would like to see more card making projects! Thanks. i'd love to see a week focused on cards or "everyday" scrapbook projects. i love this kit! What an awesome giveaway! I would like to see end of the school year teacher gifts, mother's day or father's day projects. Thanks for the chance to win. I'm a mini-album junky so this week has been inspiring. I would love to see any altered projects. THose collections are so beautiful! Thanks for a chance to win! I would really like to see more ways to incorporate 'girlish" items into a layout for boys! Having 2 boys, I am always doing their layouts and would love to know how to incorporate flowers and such into the layout without making it look too girly. Hope that makes sense! what a great giveaway! I'd like to see more mini albums and also ideas for incorporating memorabilia into projects. I'd love to see a spotlight on home décor! Love, Love, Love this kit. A cards week would be fantastic! Love these kits!I love to see something "Mom" related since Mother's Day is coming. These are precious! I would love to see a special kit with crowns...as I am working on a project that requires them....any ideas??? I would like to see a focus on cards (dimensional) and small, mailable gifts. Thanks for the mini-book feature, btw, I LOVE mini-books of all kinds. Love the kits. I am currently working on my family tree and I think the Dime Store collection would be perfect. Super cute stuff! We don't get enough of it locally. More masculine stuff would be nice. I would like to see a card week. I am always looking for good ideas for cards. I love mini albums and cards! I would love to see a week where the designers would all make pages about when they were little. I would love to see a mini album celebrating the job's of moms or the jobs of dads. Both mom and dad have days coming and how wonderful to celebrate the many "jobs" we do from cooking and cleaning to playing. Would love more card inspiration projects. Thanks! 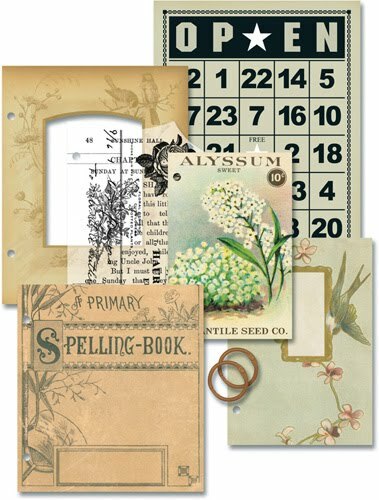 I'd like to see ideas for making traditional scrapbook pages using some of the cool vintage elements from the limited edition kits. I love to see some home decor projects as well. Thanks for the giveaway! Margaret K.
I absolutely love your products. They are hard for me to find in my neck of the woods. Thanks for always inspiring us. Documenting your childhood with vintage ephemera. oh wow the orange and teal in that kit are gorgeous.. love that combo. this "mini" week has been great. more please. Mini albums are my thing so I'm really loving this week. My kids are grown and no grandchildren yet so I'd love to see anything but little kids. I have so loved the mini album ideas - ummm....home decor? How about all about cards? Thanks for the chance at a wonderful giveaway. What a lovely giveaway! I would love a week of vintage love! What about a focus on old photos (vintage ones) with vintage inspired supplies. Kind of a 'then and now' theme. I would love a 1950s project. I loved this week as I'm a mini album kind of gal! I'd love to see a home decor week! I would love to see a week of projects inspired by the garden. Love your mini albums - it's one of my favorite things to do. What do I want next ? Since we've had such a rotten winter in South Dakota, I'd like lots of colorful things for spring and summer - maybe some flower tutorials, or things made with pre-made flowers. This is a fun giveaway! How about some inspiration for 4th of July or history of our country related... Thanks so much! Wow, lots of good ideas from the other commentators. Thanks for the chance to win. What great mini albums! I'd like to see more things done with altered tins such as Altoid's or a similar size. Home Decor - you guys always come up with such cute home decor ideas! Easter and Mother's Day layouts, please! Mix media and Vintage...would love to see more of that. Thanks. I'm loving the mini albums, especially using vintage items. love the mini albums! I'd love to see you guys do some posts and samples on journaling and distressing techniques! What a fabulous looking kit!!! Cards are my thing, but i could definately make a mini album! I love the book idea on the post above this one, keep an old book as is and decorate over it showing part of the typed pages. cool! Thanks for sharing your albums.. They are all wonderful and beautiful... I would like to see LO's using Vintage Fabric & Wallpaper..
Cards and Home Decor please! Loved the mini album ideas this week. I also love to make cards and home decor! Vintage photos or all about me pages. Beautiful vintage giveaway. I love it. How about a week of vintage/collage type pages. Thanks for a chance to win. I would love a week on cards or on themed albums. Thanks for the chance to win! I like the mini album week. Always love your home decor projects. I would love to see anything made with JBS products! Maybe something off the page? I've loved all the mini book inspiration! I love to use paper crafts for home decor and card making so I'd love to see a series to each of these topics. Thanks for the opportunity to win fabulous Jenni Bowlin products! Thanks for the chance! I'd love to get a jump on Father's day and see some gift ideas for men! Home decor projects using jbs-goodness would be great! Graduation ideas?? What great prizes! Thx 4 asking what we would like...so sweet! I already think you are doing such an excellent job inspiring everyday, it's hard to suggest you do anything different. Mixed Media is my passion so that might be fun and i have a grad too! I love the garden mini book. Gardening is my second hobby, so I would really be able to use it. love,love,love mini album week! Another topic I would like to see covered is 'stamping'! I love stamps, but I know that I don't use them to their full potential!